We are becoming a more urban people, and Polish-Australian architect Mark Krawczynski has helped design a building that will generate enough power to meet more than its own needs. Channeling wind, solar, rain and geothermal energy, the design will change how we think about buildings and contribute to health for millions, Krawczynski says. The Elemental Flow Towers project was conceived by a team of international designers and scientists. They created a building that channels wind into a central wind turbine, is covered with solar cells and has a rain water power generation and management system. By using new technologies, the building will “save the air and the water essential for healthy living and provide better lives for us and our children as well as providing more skilled jobs,” Krawczynski says. Krawczynski is an architect, artist, pianist, marketing consultant, project manager, president of “The Future for Poland” Foundation and a board member of the NSW Board of Architects in Australia and the Polish Architects Institute. He was born in Warsaw, Poland, and spent most of his life in Australia, where he graduated with honors from the Conservatorium of Music in Sydney and graduated with distinction from the Architecture Department of the University of NSW. His portfolio includes more than 80 public and private projects, including the award-winning additions to the Australian Museum and the reconstruction of the Sydney Opera House. To read more, click here. 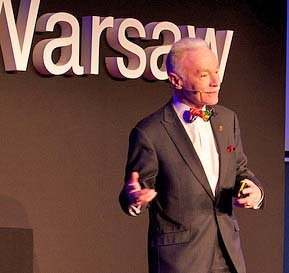 His TEDxWarsaw talk discussed architecture as a means to fostering national identity. His UW-Madison talk is co-sponsored by COWS, the Global Health Institute, Nelson Institute for Environmental Studies, Office of Sustainability, and the proposed Environmental Sustainability Rotarian Action Group.